HD4030 Digital Temperature Regulator Thermostat with Display 48x78, Pt100 Sensor. Measuring range -50° C +150° C. Resolution 0,1° C. Proportional band ± 1,5° C ... ± 15° C. Relays 5A 220V resistive. Power supply 24Vac/dc, on request 110…230Vac/dc. HD4030BM Digital Temperature Regulator Thermostat with Display. 48X78, Pt100 sensor. Measuring range -50° C…+150° C. Resolution 0,1° C. Dead band 0.6...6° C.
Output with two independent relay 5A 220V. Power supply 24Vac/dc, on request 110…230Vac/dc. 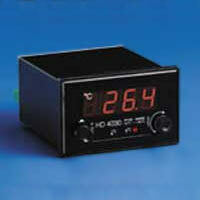 HD4030BM Digital Temperature Regulator Thermostat with Display. The regulation characteristic is of the PID type; the proportional band may be set at the rear of the thermostat by means of a single-rev trimmer in the range ± 1,5° C ± 15° C.
on the front panel. The instrument has a Pt100 Platinum temperature sensor (100ohm at 0° C). With the three-wire connection, the line resistance is automatically compensated up to 5 meters. (for example when switching on).